Chopped dried dates — try using less honey since dates are naturally sweet! Mini chocolate chips — a little goes a long way! So it’s officially holiday entertaining season and you know what that means…scouring the internet for appetizer, entrée and dessert recipes. It’s always a personal challenge of mine to out-do myself when it comes to entertaining. No one expects it, but there’s a sense of satisfaction knowing that this year’s menu was better than last year’s AND that my guests loved it just as much as I loved Pinterest-ing for two weeks to find the perfect recipes. Call me Miss Type-A. Entertaining this holiday season and in need of a dessert recipe? I’ve seen this one all over Pinterest and I had to try it based on my love for the never-fail cheese ball and red velvet…well, anything. Think of this as a sweet version of a cheese platter, a “dessert appetizer” to make up a completely new menu category. 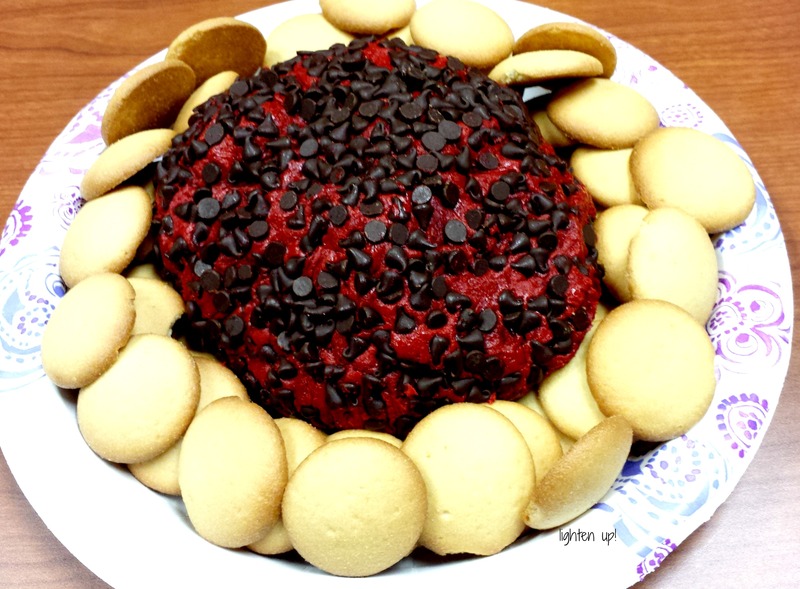 The red velvet chocolate chip cheese ball is creamy, sweet and decadent thanks to the layer of mini chocolate chips which add the perfect amount of crunch. Made with red velvet cake mix, cream cheese, butter and sugar, the sweet cheese ball is definitely a treat but it’s SO worth it (just like the 15 Christmas cookies I ate in one sitting at my work holiday party…oops!) I served this with vanilla wafer cookies, but animal crackers or graham crackers would also pair well. I (of course) lightened up the recipe a bit by using 1/3 less fat cream cheese and margarine instead of butter. The best part: it took 10 minutes to make PLUS the red color is super festive! Well, it’s official, winter seems to have arrived. Today was the first really cold morning that I left the house wearing a winter coat, scarf, gloves and ear warmers. I definitely have a love-hate relationship with winter…snow is fun only during the first snowfall, until you have to shovel or dig out your car. I hate being cold but I love skiing, ice skating and hot chocolate (with marshmallows). While I miss the warmer summer months, the best thing about winter (and the holidays) is all the rich food we get to eat! Holiday cookies, cakes, drinks – winter is definitely “eating” season. When you feel like curling up with a warm comforting dinner but you don’t want to completely ruin your diet, caramelized onion and spinach butternut squash pasta is the perfect dish. I had never thought to use squash as a pasta sauce until I found this recipe from Lauren’s Latest. Genius! 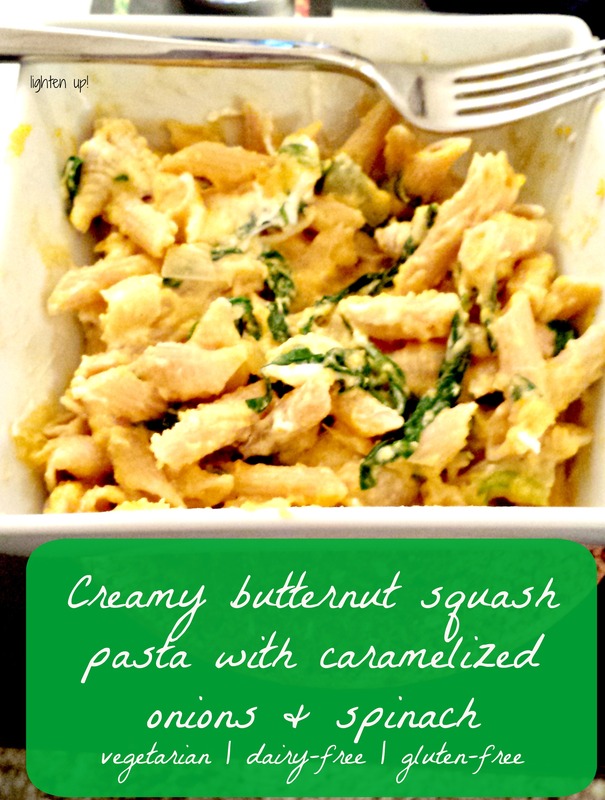 The pureed butternut squash feels like a creamy, decadent sauce, but in reality you’re still eating your veggies! I added caramelized onions and spinach to bulk up the dish without adding meat, but you could surely add in chicken, sausage, etc. Yes, I am one of “those” girls when it comes to pumpkin season. My coffee of choice? Dunkin Pumpkin k-cups. Pumpkin cream cheese on my pumpkin bagel, please. Pumpkin cocktails for Thanksgiving. 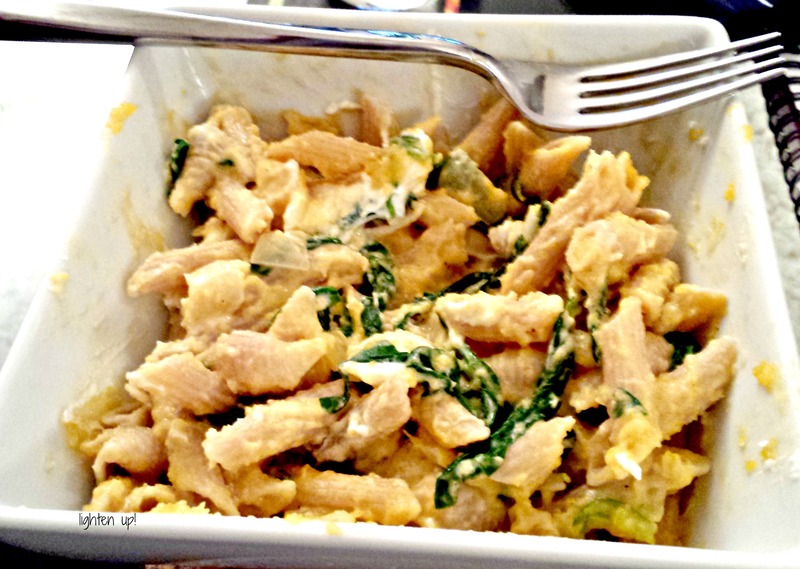 Pumpkin for dinner like this pumpkin pasta bake I’m dying to try. The list goes on and on, but hey, pumpkin season is a limited time offer, so I have to get it while I can! My list of “pumpkin everything” recipes is pretty long, but this one came to mind first since I was short on time on a weeknight (shocking, I know). I’ve made these super easy fall-favorite cookies before, but never for an unbiased audience (aka not the hubby), so I wasn’t sure how they’d go over for my work potluck luncheon. 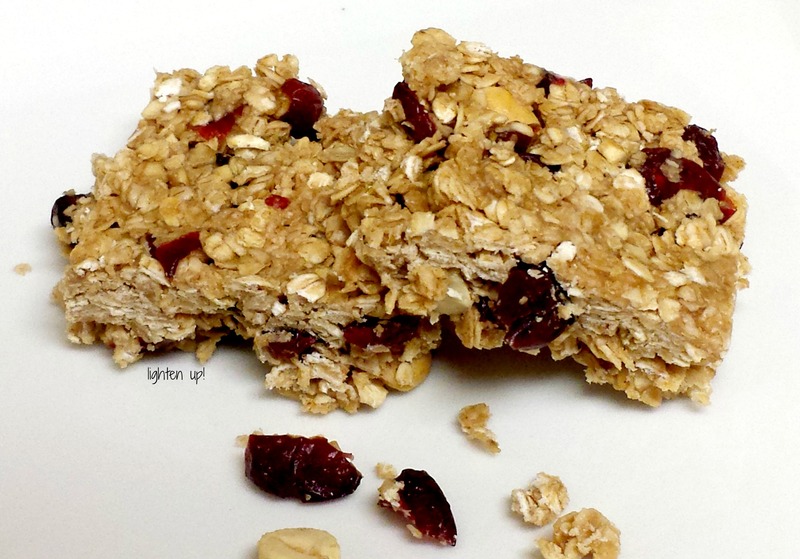 Let me tell you, they were such a hit that I made another batch for the office a week later! 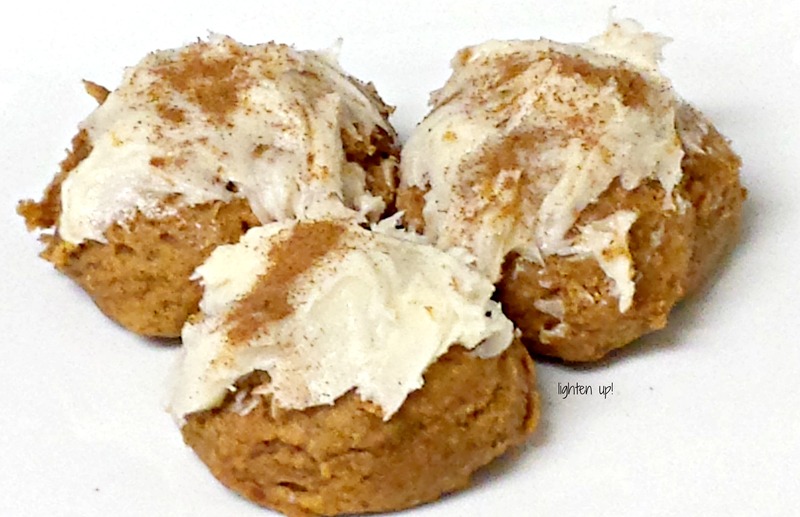 The soft cake-like texture topped with sweet cream cheese frosting and a dusting of warm cinnamon creates the most delicious pumpkin cookies ever. The cookies themselves are not overly sweet, so the frosting provides the perfect touch of creamy sweetness. Oh, and they’re really not terrible for you since there’s no oil, no butter, and no eggs. My co-workers helped themselves to seconds (and thirds). These cookies would be a hit at Thanksgiving, holiday parties, cookie exchanges, you name it. With a handful of ingredients and 20 minutes, you can have these babies ready to go! 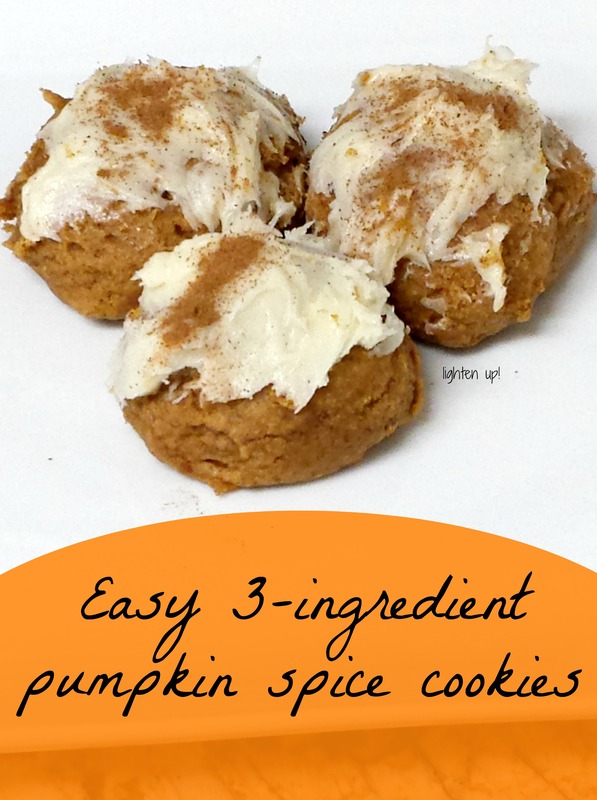 This recipe is also extremely versatile – I use it to make pumpkin bread in a loaf pan, and it would be great as pumpkin muffins or as pumpkin whoopie pies (just sandwich two cookies together with cream filling)! It’s just about boot and sweater weather in the northeast, and since we didn’t have time last year because of our wedding, (I was too busy dealing with seating arrangements and hotel giftbags) we took FULL advantage of apple picking this season. While I made it my apple-picking-mission to find a few of each type of apple from the endless rows of apple trees, the hubby decided to taste-test one from every category. Win-win! While the apple hunting was entertaining, there’s really nothing better than the check-out line at the local apple orchard – there’s always an abundance of hot apple cider, apple cider donuts, and fresh apple…well, anything. After bringing home a whopping 8 pounds of apples, I could only imagine the endless apple recipes I could make! 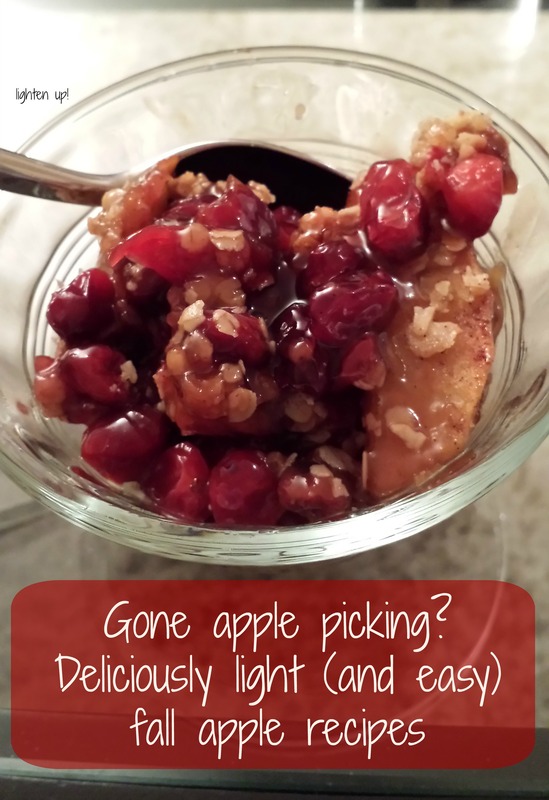 My go-to fall dessert last year was Skinnytaste’s apple cranberry crumble and this is just one of those recipes that stands the test of time. The tart cranberries combined with sweet apples and crumbly oat topping is always a crowd-pleaser and it’s one of those desserts that the hubby always asks for (and he always has a second helping). I make a few modifications to make the recipe dairy-free and gluten-free like swapping out butter for coconut oil, using coconut palm sugar, and cornstarch instead of flour to thicken up the sauce. Serve it right out of the oven for a warm treat on a cool night. 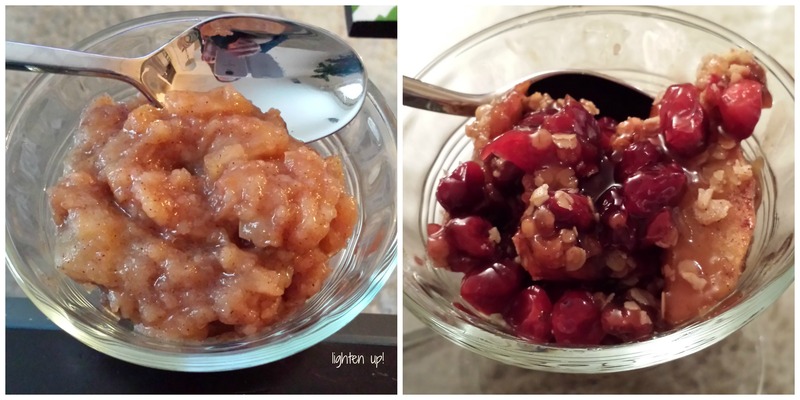 I also found a fantastic crockpot apple sauce recipe to put the rest of the apples to good use (see pic on top left). We had picked a combination of red delicious, gala and Cortland apples and I used all three variations in the recipe. If you have a lot of apples on hand, make a double batch and freeze the leftovers (if there are any!). This super easy recipe from the Frugal Girls has only a handful of ingredients and will make your house smell amazing! I added a sprinkle of nutmeg which added a warmer, ‘spiced’ flavor to the applesauce, almost like apple butter. Happy apple picking (and apple baking)! Now that the birthday/holiday/work travel rush is officially over, I’m back in the kitchen after a few weeks of running around and eating restaurant food for almost every meal. I missed cooking (really, I did! ), but of course I came back to a CRAZY busy week at work. What could possibly make me happy in this situation? Coming home from a long day of work and having dinner practically made for me! In this case, one pound of low-or-no-fat ground turkey does the trick. The ground turkey is mixed with fresh, smoky southwestern ingredients and spices to create two delicious recipes that are gluten-free, dairy-free, and chock full of veggies! Turkey stuffed peppers are fantastic to make when you have some extra time (aka Sunday night) since they take about 40 minutes to bake. Just whip up the whole pound of turkey and keep leftovers in the fridge for Taco Tuesday (or Wednesday, or Thursday)! Turkey stuffed peppers are the perfect one-dish meal! Smoky cumin-spiced turkey mixed with hearty black beans and sweet tomatoes and onions make for a healthy yet filling meal. I ate one red pepper half (the hubby had two) and I had plenty of leftovers for lunch the next day. 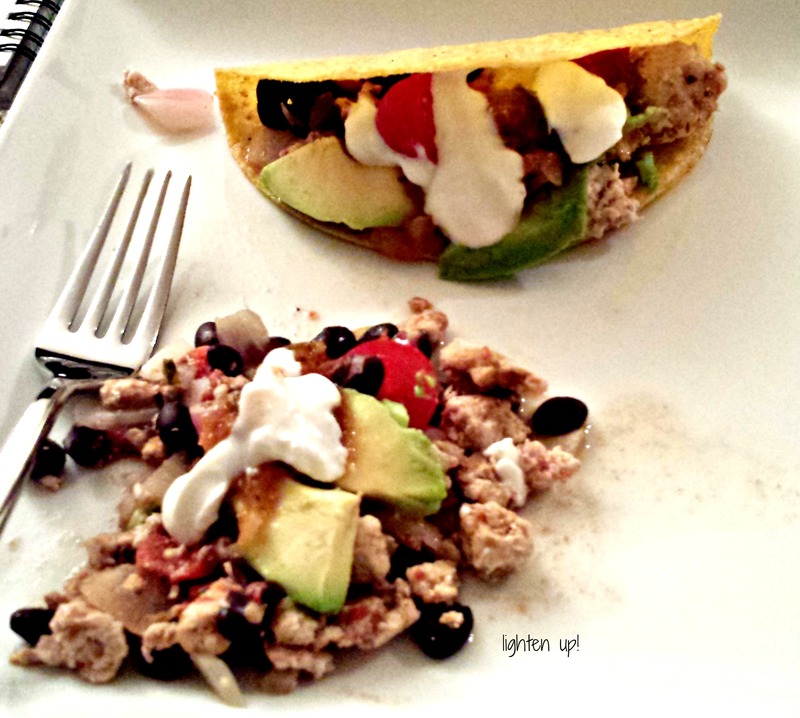 The spiced turkey/bean/veggie mixture does double-duty as delicious taco filling! I sliced up some avocado and served the tacos with toppings like cheese and Greek yogurt. Heat up some rice and serve with a big side salad for a complete meal. This turkey taco filling would be great for game day or for your own family taco bar! 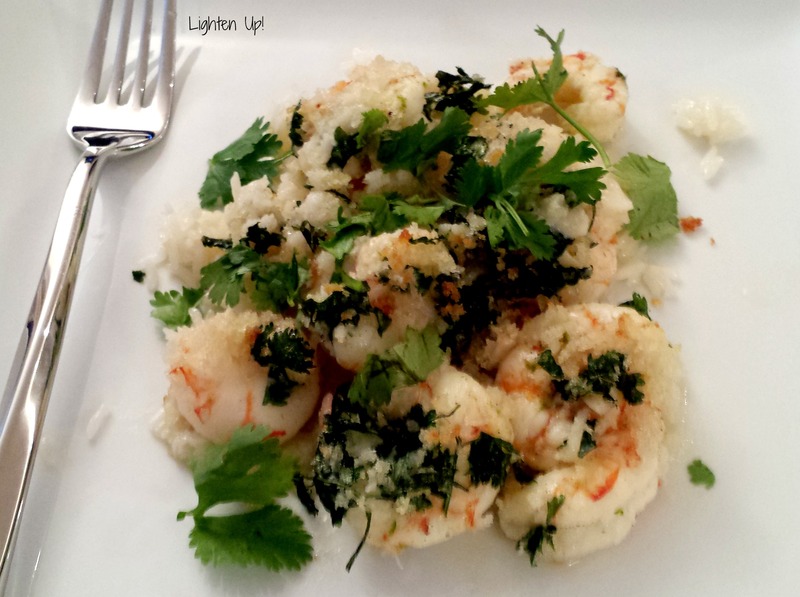 If you ask the hubby what his favorite food is, without hesitation his answer will be “shrimp.” Every shrimp dish I’ve ever made for him has been a winner in his book, because in his mind, there are no “bad” shrimp dishes. I happen to think he’s right! I love to cook shrimp dishes because they’re easily and quickly defrosted from their frozen state, cooked for a few minutes, and they’re ready to eat. They literally go from freezer to plate in 20 minutes, something I can never say about any kind of meat! 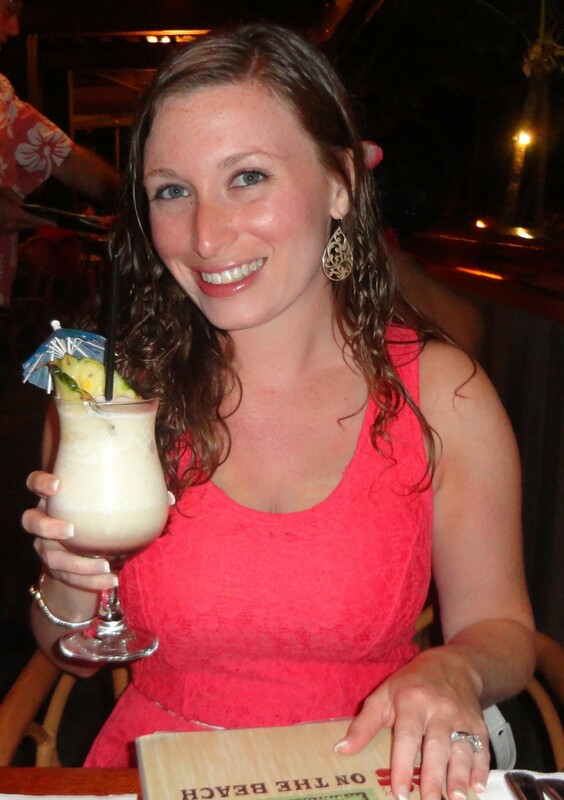 Pina Colada on my Hawaiian honeymoon. Life is good! Never miss a recipe! Enter your email address to follow Lighten Up and receive notifications of new posts by email!